This auto-retractable pocket cutter with replaceable ceramic blade features a rubberized slider button to limit the amount of exposed ceramic-blade to further reduce injuries. 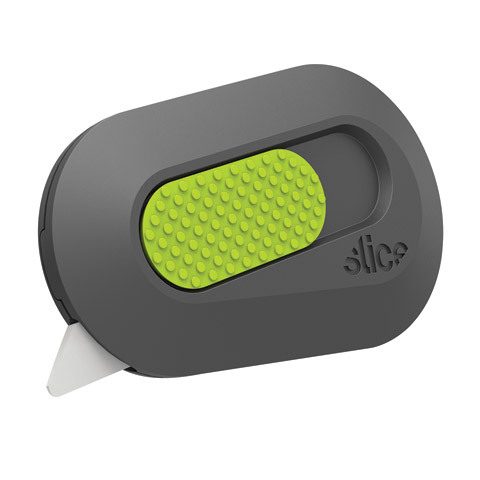 The blade automatically retracts back into the housing for added safety when the slider button is release. The double-sided #S3 ceramic blade is hand sharpened and designed to reduce injuries by incorporating a safer rounded tip. The sharpness level lasts up to ten times longer than steel, resulting in less blade changes and fewer potential injuries. The small and convenient size slips into a pocket without the worry of an exposed blade. The blade is non-conductive, anti-magnetic and does not rust. The cutter includes a built-in magnet. Replacement blades (MVSL10404) come in packs of four and can be purchased separately.